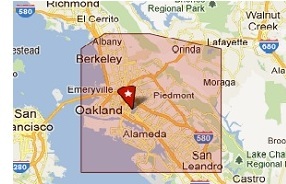 Local Oakland Electrician serving the Local Berkeley Oakland East Bay Area and nearby surrounding cities. We stay local to the Oakland area. That way we can get to you quickly and help you to address your concerns promptly. Thirty years serving the local Oakland East Bay Area. Journeyman electrician serving the Oakland, CA East Bay area since 1980. For home or business, new work installations, troubleshooting, maintenance, repair and upgrades. Pay by cash, check, credit card: we accept VISA Mastercard PayPal. Available daytime and after hours, nights, weekends, holidays, and open for 24 hour emergency services. Electrical Service area includes: Oakland East Bay Area, Richmond, Albany, El Cerrito, Berkeley, Emeryville, Oakland, Orinda, Piedmont, Alameda, San Leandro, San Lorenzo, Hayward and surrounding cities. My Oakland Electrician stays local to the Oakland East Bay area. Instead of running all over the Bay Area and beyond going after "the big jobs", we are local to the area so that we can get to our customers quickly. Most jobs are small jobs: troubleshooting, repairs and upgrades.